Suite Rental: Rent a private suite for up to 24 people. Cost: $890 for suite (Includes 16 tickets). Up to 8 additional tickets can be purchased for $40/ticket. Multi-Platinum hitmakers WARRANT and GRAMMY nominated Great White team up for one night to bring Ralston Arena rockers to their feet with a catalog of arena rocks most iconic, played and listened to songs on September 11 at 8pm. Formed out of California at the rise of arena glam rock, Mark Kendall— founder/lead guitarist of Great White— and members Michael Lardie, Audie Desbrow, Scott Snyder and Terry Llous have sold over 10 million albums worldwide. The GREAT WHITE song arsenal includes “Rock Me”, “Save Your Love”, “The Angel Song” and the timeless “Once Bitten, Twice Shy” that made the band a household name thanks to heavy rotation in the formative years of MTV. Along with Great White will be the ever popular WARRANT. With over 10 million albums sold, fans first came to know the legendary band by their Double Platinum debut album Dirty Rotten Filthy Stinking Rich which featured the #1 “Heaven”, and continued success with the follow up Double Platinum album and title cut Cherry Pie. 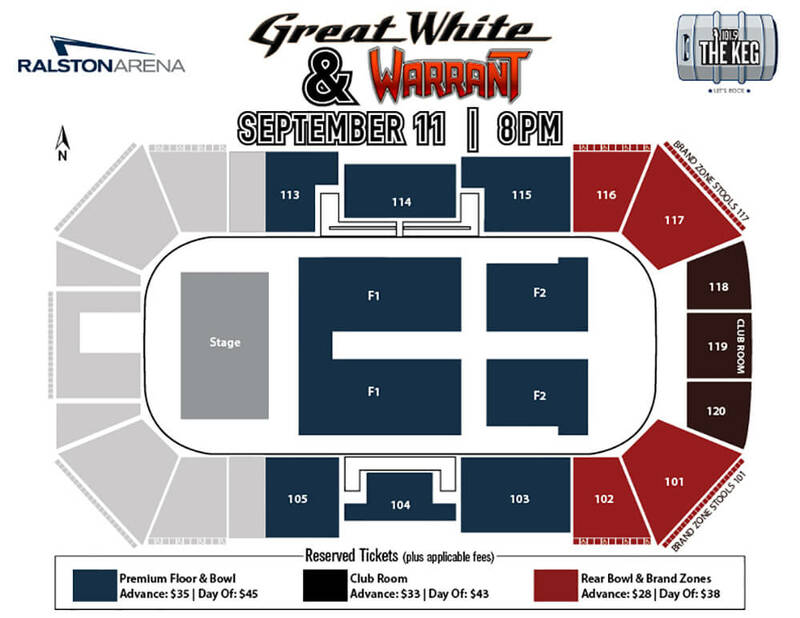 Take a free shuttle from Horsemen's Park (6303 Q Street) to the Ralston Arena for Warrant & Great White. Shuttle starts at 7pm and end 30 minutes after concert end time.